Take a peek at how celebrations to ring in the New Year are looking at the heart of the capital. This year the center of New Year’s Eve celebrations is happening at Hviezdoslav Square, with the music of the Gypsy Devils to entertain visitors and a disco continuing to the early morning hours. Something new this year is a giant lighted clock at Ľudovít Štúr Square to count down the final seconds of 2016 and interactive digital fireworks at the Main Square. Visitors can look forward to the music of Gypsy Devils and also a disco where the fun lasts until the early morning hours. Midnight fireworks will be lit from a boat on the river to the musical accompaniment of Johann Strauss’s “Blue Danube”. There will be security services looking after the safety of visitors, reinforced by patrols of city and national police officers with fire and paramedic teams standing by. At 6:00 in the evening the fun starts in the center of town for both Bratislava residents and visitors from near and far, with music to be played by a DJ at the main stage on Hviezdoslav Square. The open-air disco starts at 10:00 PM, featuring the temperamental rhythms of the phenomenal Gypsy Devils. Even though they will be playing until midnight, the disco itself continues to hop until the early morning hours. Christmas stalls will be selling refreshments and snacks during the New Year’s Eve celebrations, with a rink to provide outdoor skating until 1:00 in the morning of New Year’s Day. The Primate’s Square rink will remain open to the public until 7:00 PM, when the square will be closed for safety reasons. If it isn’t enough to watch the fireworks display, anyone can visit the Main Square during New Year’s Eve to create and light their own fireworks on the big screen. The digital interactive fireworks will be running alongside other “smart” novelties for this year’s Silvester, as New Year’s Eve is called. Anyone will be able to use an application on their mobiles to connect to a specially crafted wireless network, using their own imagination to create a large-scale interactive projection of abstract explosions based on their own designs and wishes. Bratislava authorities remind the public that new general pyrotechnic regulations strictly forbid the use of freely available fireworks. 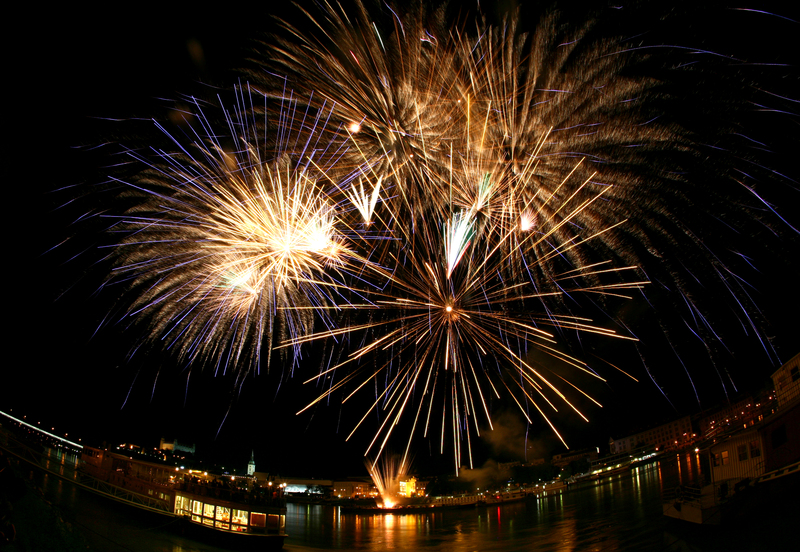 EXPERIENCE THE BEST NEW YEAR’S EVE NIGHT IN YOUR LIFE IN BRATISLAVA! There will be six police checkpoints at entrances to Hviezdoslav Square making sure visitors entering the central part of the Old Town are not carrying anything dangerous such as glass bottles or sharp objects. 6. Hviezdoslav Square from the U.S. Embassy to the corner of Straková ulica. Please report emergencies such as a lost child or missing items to a host, who will make an announcement from the stage. There will be a “lost and found” area and a gathering place for lost children at the Primate’s Palace. The city would also like everyone celebrating New Years’ Eve in Bratislava to think about using mass transit and avoid driving into the town, as traffic restrictions in place for the event could cause complications for those traveling by car. Vajanského nábrežie and Ľudovít Štúr Square will be closed to traffic between 11:00 PM on December 31, 2016 and 2:30 AM on January 1, 2017.